I recently sent out my beloved cat dress to be borrowed by a few of the Flock Together girls, but I made sure to snap pictures in it one more time before it was out of my possession. I figured I would share the most recent way I styled it right before the other girls share their takes on it, and you can see more of how over on the Flock Together blog today. See you there! 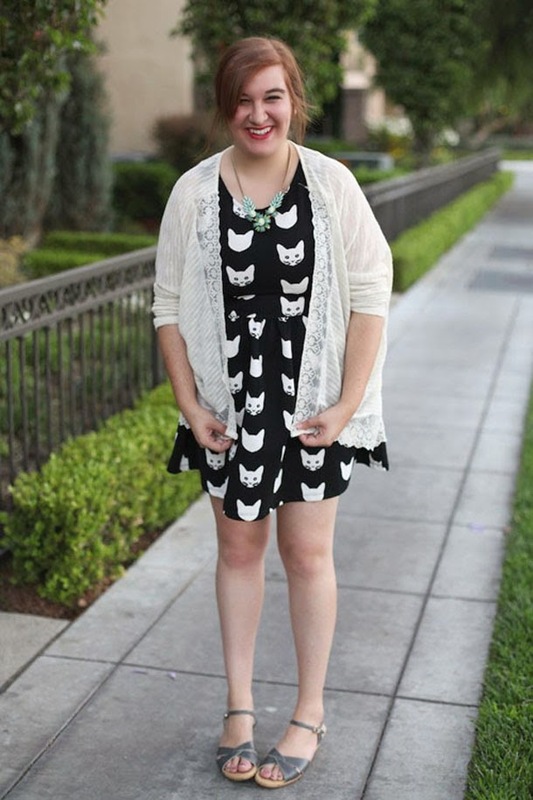 Love the cat dress! I have one that's a white background with black cats on it. All my kittehs are black so it's appropriate. That dress is super adorable! I can see why you wanted to snap some pictures first! I love the dress!! And the way you styled it-- so adorable. I'm a total cat lover, so by default I'm in love with this dress. You've got style! Love that dress! I have the skirt form of it and I love it! SUPER cute! ugh I seriously need this dress in my life! What a cute dress! We absolutely love the way you've styled it. We're hopping over to the see how the others styled it now!